Victorian Christmas Cards – The very first Christmas card was printed in December 1843, at the request of Sir Henry Cole, who was also the instigator of the Great Exhibition of 1851 and founder and first director of the Victoria and Albert Museum in London. 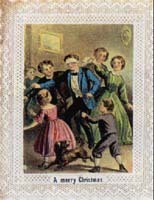 Indeed, he was responsible for the whole idea of sending Christmas cards through the post when he decided to surprise his friends with a novel and colourful card at Christmas time instead of the usual Christmas letter. The artist J.C.Horsley was commissioned to produce the card which is now among the most sought after by collectors. The card illustrated a wealthy family enjoying a Christmas feast as they all toast the festive season by sipping wine and it was all set whithin a woody, rustic border hung with ivy, grapes and vine leaves (holly did not appear on Christmas cards until 1848). In fact, some years ago, one such card was sold to an American buyer by a well-known London auction firm for £400. Another came up for auction in November 1987, and it fetched an incredible £2,000. 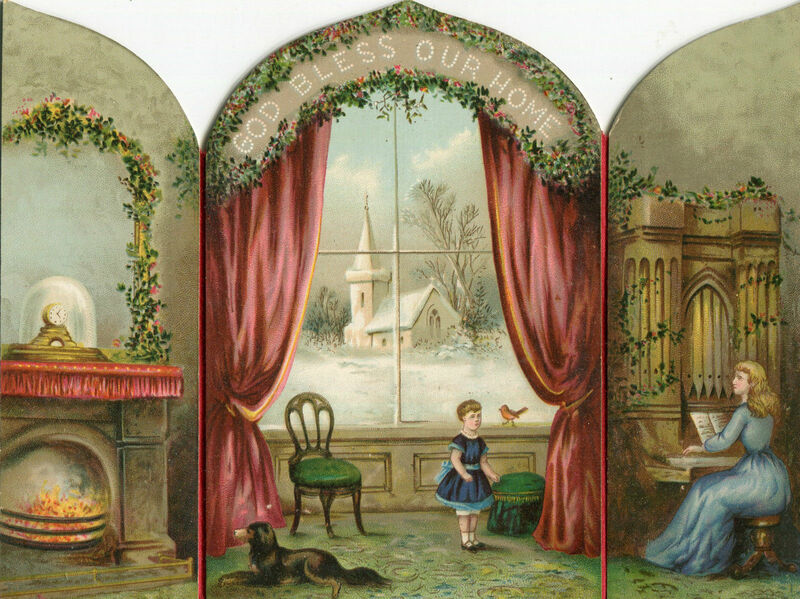 Pictured an exceptional Victorian fold out Christmas Card. This card sold for £135.88 on ebay in June 2016. One of the most avid collectors of Victorian Christmas cards was Queen Mary, and she amassed a large number of cards bought by Queen Victoria who, not only sent such attractive cards to her immediate family, but she sent them also to her very many servants at Windsor and Osborne. Queen Mary’s collection of cards were placed in a large number of albums and these are housed in the British Museum in London. However, the greatest Christmas card collector of all time must be Johnathom King of Islington, London, who spent his whole life collecting these cards. In the 1890s his collection weighed between six and seven tons, and included nearly 200,000 cards published between 1862 and 1895. He did intend to donate this unique collection to the British Museum at his death, but unfortunately his massive collection was almost destroyed in a fire that gutted his house, so that many unique cards have been lost forever. Many cards were extremely elaborate with gilded, embossed, shaped, pop-up and pierced forms. 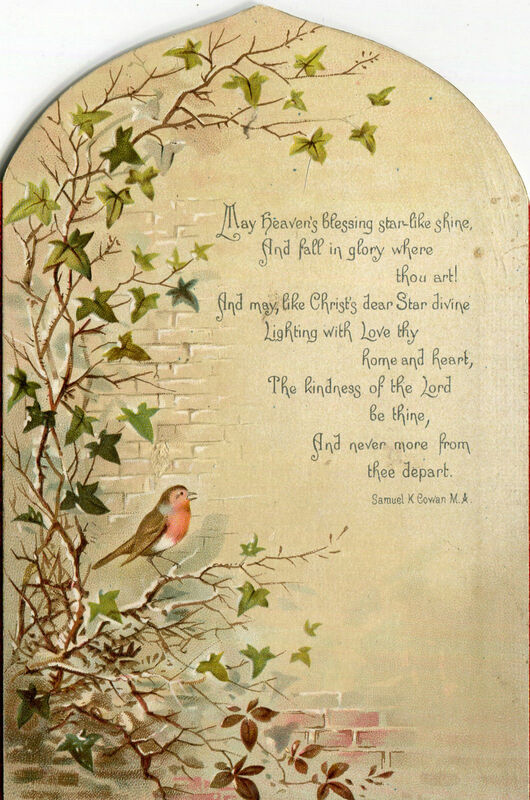 Very few of these early Victorian Christmas cards illustrate the religious meaning of the festival, and they rarely show landscapes blanketed in snow or warmly clad skaters on ponds or even reindeers pulling Father Christmas’s sleigh over the countryside which are all so common today on our cards. The Victorians illustrated nature in all its form on their cards since they were passionately fond of the countryside, and so they gloried in colourful cards which depicted delightful pictures of spring and summer in particular. Very early Christmas cards hence have attractive birds on them together with their nests and eggs. Flowers of the countryside were also immensely popular as illustrations, and flying butterflies among stalks of wheat and even insects landing on ripening blackberries were included by the early artists of Christmas cards. All these images were a reminder to everyone that bleak Winter would soon give way to sunny days once again since nature was but resting at Christmas time. 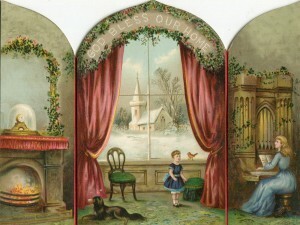 Many collectors of Victorian Christmas cards will search avidly for the renowned artists of the time who illustrated such beautiful scenes which appeared wide such regularity on them. Many of them were actually members of the Royal Academy such as G.D. Leslie, J.C. Herbert, Geroge Clausen, W.C.T. Dobson end W.T. Yeames, all of whom were paid many thousands of pounds by Christmas card manufacturers of the time for their illustrations. 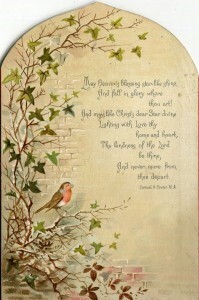 Another area for collecting is that of the poets who penned verses for these lovely cards. We know that Alfred Lord Tennyson, the one time Poet Laureate, was offered as much as a thousand guineas if he would contribute a dozen or so short pieces suitable for such cards – but he declined the lucrative offer. 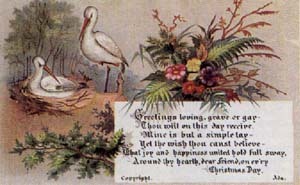 It’s quite easy to come across on these cards, the work of Helen Burnside, who was the favorite poet of Queen Victoria. Between 1874 and 1900 she penned as many as 6,000 Christmas card verses, and so earned for herself, the title o the ‘Poet Laureate of Christmas cards’. 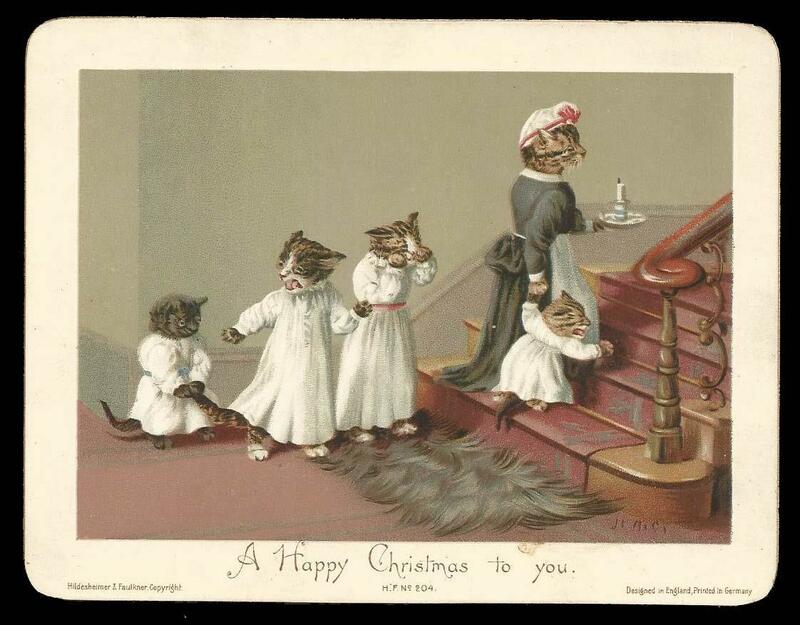 Small children were sentimentalised on Victorian Christmas cards, with children of the poor and orphans as well, being extensively portrayed. Indeed, a large number of such cards were published at the time; it was the era of sailor suits and pretty bonnets in particular. 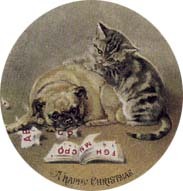 Domestic animals were also popular on cards in particular cats in comic poses around the household and dogs in anthropomorphic postures, such wearing funny hats or posting letters. 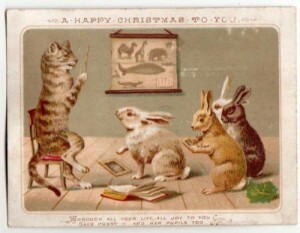 Perhaps the most expensive of all Victorian Christmas cards are those which have special shapes to them. 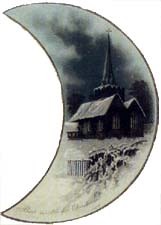 These delightful cards are often seen as circles, oblongs or a half-moon, and the ‘Hold To Light’ card, where hidden scenes appear as the card is held to the lights, is prized indeed by collectors. Will the cards of today be so highly prized in one hundred years time? 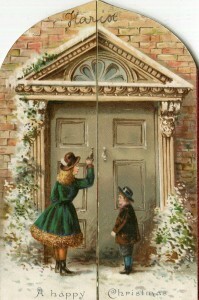 Victorian Christmas Cards Price Guide – Prices for Victorian Christmas Cards can vary from £1/$1.50 to £200/$300 and upwards. Prices for the same card can also vary greatly. ebay is the main access to purchase Victorian Christmas Cards and also a good place to check values. 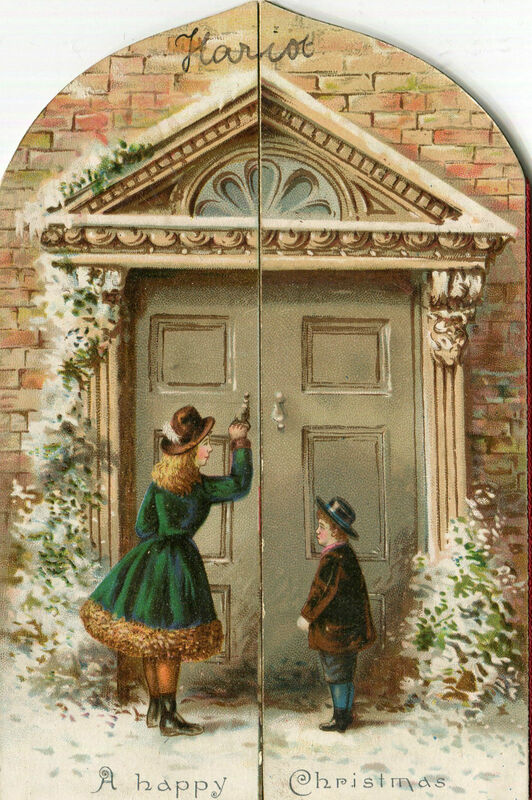 There are normally a thousand or so cards on at anyone time – click to view Victorian Christmas Cards on ebay .